Ironband | Ironband / KC Marathon – Win a FREE Race Entry! 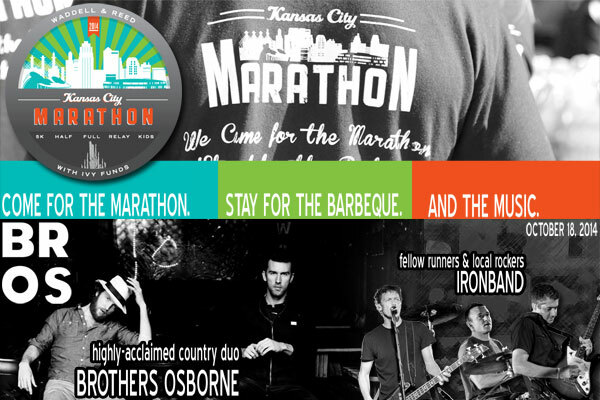 Ironband is thrilled to once again be a part of the live music lineup at the 2014 Waddell & Reed Kansas City Marathon Finish Line Festival! We’ll get things rocking as the runners start crossing the finish line after which the talented Brothers Osborne will take the stage and turn things up with their hits such as Rum and Let’s Go There. Live music, Kansas City barbecue and cold beer – as veteran finishers of this race we can’t think of a better way to finish a marathon, half-marathon or 5K! Wanna race for FREE? Ironband, in conjunction with the Kansas City Sports Commission, is giving away a free entry – just follow the steps below and we’ll draw a winner from the Facebook Likes and Twitter Retweets nextFriday, September 19th! 1) If you haven’t already done so, “Like” the Kansas City Marathon & Ironband Facebook Pages. 1) If you haven’t already done so, follow @IronbandMusic and @KCMarathon on Twitter. 2) Retweet Ironband’s tweet featuring the image below. That’s it – we’ll combine the Facebook likes and Twitter retweets and draw a winner next Friday. After that, it’s up to you – lace up those shoes and we’ll see you on October 18th!